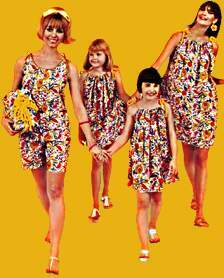 The Sixties spawned some novelty dresses. People experimented with the new ease in fashion. Advertisers hopped on the trend to offer these inexpensive items as incentives. The paper dress to the left was offered as part of a promotion for Johnson’s Pies. You paid $1.25 plus S&H. Made by the Scott Paper Company, fire resistant, it tied at shoulder for “easy step-in styling” and had side slits to “let you kick up a sensation.” And yes, after wearing, you threw it away. The outfits below are from Hallmark, the card people. There were matching round paper plates, napkins, and placemats too! Blazing Northern-light, neon-bright fun colors spark dazzling new designs. Swinging tent dress in smart mother-daughter styles or a chic jumpsuit. Quite simply, a bra dress had a built-in bra. Like a swimsuit. This way you didn’t need to wear a strapless bra but could still keep your girlish fiqure. Not hard to see why this wasn’t a long-lived thing.